I was watching Anne of Avonlea yesterday on YouTube, because I’m cool like that, yo. Anne and Marilla, Anne’s adopted mother, kept talking about plum puffs, how Marilla makes amazing plum puffs and how they make everything better, and I was like, what is a plum puff? Because I think I want to have one. The Anne of Green Gables series always does that to me. I remember that when I first read the book as a kid, I was taken in by the chapter where Anne makes tea for her friend Diana and they eat fruit cake and cookies and “snaps,” whatever they are. Then they think they are drinking raspberry cordial and it ends up being current wine instead–neither of which I have tasted to this day–and then Diana gets drunk and her mother bans her from ever seeing Anne again. 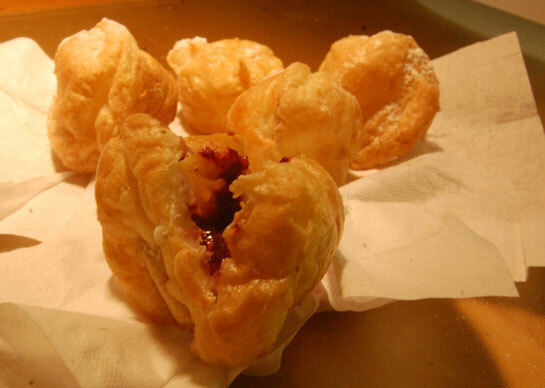 Well this time, I decided to look up what a plum puff is. I came up with a few options (which makes me wonder if LM Montgomery made plum puffs up, but I digress). This site has a plausible recipe (scroll down)–sounds like a puffy cookie with raspberry jam on it. Okay, not bad. Not exciting, but not bad. Then there is this recipe, which is a cream puff type thing with raspberry jam in the center. 1. Preheat the oven to 375° and line a large baking sheet with parchment paper. On a lightly floured work surface, roll out the puff pastry 1/8 inch thick. Cut the pastry into six 6-inch squares and transfer to the baking sheet; freeze for 5 minutes. 2. In a bowl, toss the plums with the 1/4 cup of sugar and the cornstarch and cardamom. 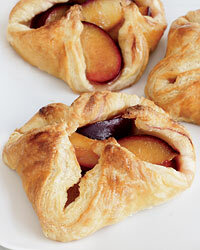 Spoon the fruit and juices onto the center of each puff pastry square. Working with 1 square at a time, bring up all 4 corners and pinch them together in the center. Pinch the seams closed at the bottom corners to trap any juices, leaving the tops open to vent steam. Brush the pastries with the egg and sprinkle with sugar. Bake in the center of the oven for about 30 minutes, until puffed and golden. Let cool slightly and serve with scoops of vanilla ice cream. Now, did they have puff pastry that they could conveniently get from the freezer section in the grocery store in 1909, when Anne of Avonlea was published? No. But this is the kind of plum puff I would find capable of “heartening me up,” like it does to Anne in this chapter of the book. So I figure it has the spirit of the thing right, anyhow. And that’s the important thing. I had to make a dessert for more people than I had planned for; had a big bag of plums and found this recipe and choose it. The commentary intrigued me and they looked beutiful, so I made them. I used cinnamon and nutmeg instead for spices, and some of my neighbors home made honey– it is Rosh Hashanah and wanted to incorporate this . I did the plums and let them macerate overnight. Will def. make these again!